The popular image of the Salvation Army as a bunch of well-meaning eccentrics banging huge drums and smiling benignly at passers-by, is one the organization is happy to present to the public at large. The connection between a pseudo-militaristic and close-knit, hierarchical organization and Christianity is on the face of it difficult to grasp and yet there's something solid and reassuring about a Sally Army Band enthusiastically banging out their greatest hits on a cold Winter's night and they have a way of lightening the spirits of even the hardest of hearts. But the uniforms and clashing cymbals are only the tip of a very big iceberg and beneath the façade lies a seriously efficient organization which has been quietly and unassumingly performing good works since its inception in Victorian London. 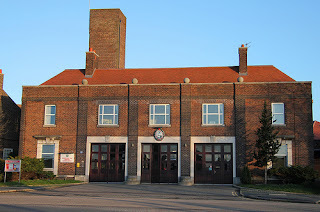 The less fortunate members of our society, the homeless, the lost-souls and the downhearted have good reason to be thankful to William Booth and his wife when they looked around Victorian London in 1865 and not liking what they saw founded the Salvation Army with a rallying cry of 'Soup, Soap and Salvation'! The practical and pragmatic help that Booth and his wife offered was a far cry from the posturing of the hell-fire preaching of the day and if helping our fellow man with humility and practicality is the true spirit of Christianity then the Army and its adherents have much to be proud of. General Evangeline Booth was the fourth daughter of William Booth and it was she who opened Strawberry Field in 1936 after it was bought from the original owner, miss Mary Fawley. 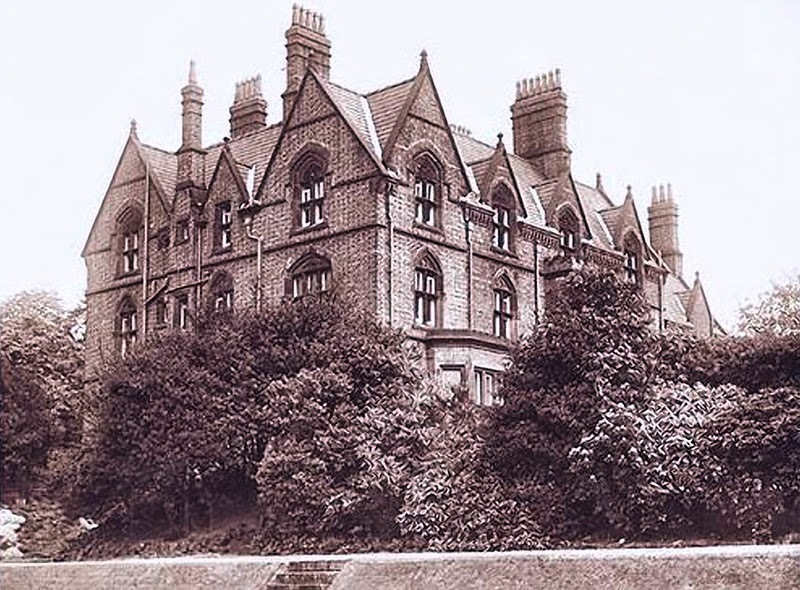 The Victorian Mansion was converted into an orphanage for girls from the slums of Liverpool and for decades afterwards there were many saved from a lifetime of misery. Tucked away behind closed doors (or gates in this case) in a serene and rural setting it was an ideal sanctuary for the rehabilitation of traumatized minds. For an adolescent John Lennon and his pals it was an ideal setting to dream dreams, cement relationships and germinate ideas for songs. 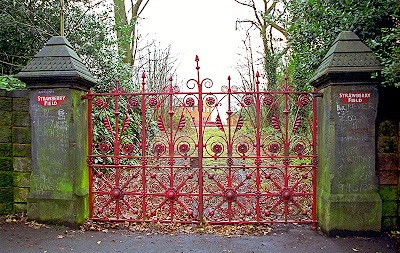 Strawberry Fields Forever, the song, evokes perfectly those delicious, escapist reveries when John took refuge in the grounds of a Salvation Army home, perhaps subconsciously he identified with the broken dolls that dwelt there and perhaps he was looking for some comfort of his own. 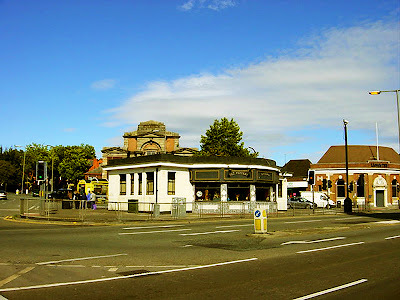 This part of Woolton is one of the highest points in Liverpool and harks back to a time when beacons were lit on the highest points throughout the land as means of communication in times of war and so on and it is on Beaconsfield road that the gates to Strawberry Field can be found. Just a few years ago they were stolen and children nearby said they saw two men put the 8ft high gates into a blue Transit van and drive away. They turned up in a scrap yard awaiting destruction. Police said the dealer made contact after wide-spread publicity surrounding the disappearance of the wrought-iron gates. 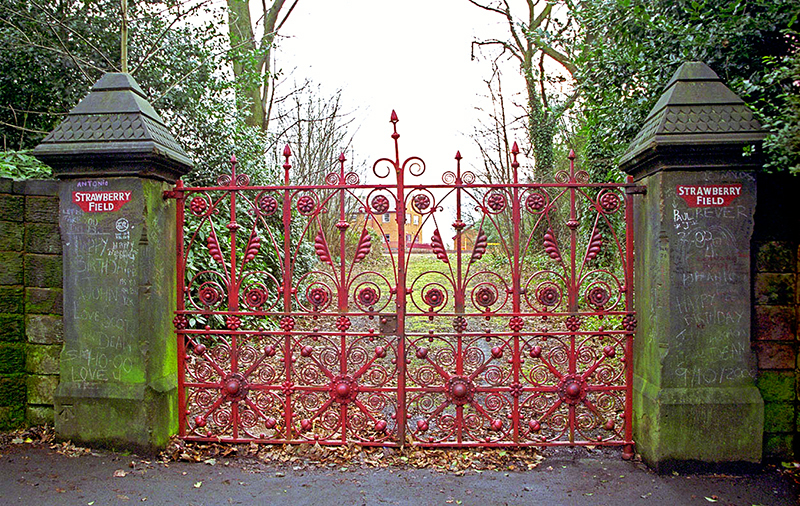 In May 2011 the gates to Liverpool's Strawberry Field gates were removed to prevent any "further damage" being caused to them. 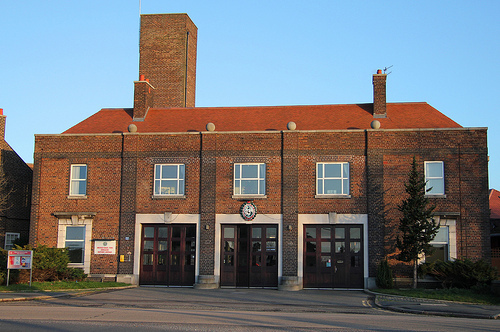 The Salvation Army, which still owns the site immortalised in a song by The Beatles, replaced the original gates with handcrafted replicas. The 100-year-old wrought iron gates were taken into storage for "safe keeping". The replacements have been made by a local specialist, Jim Bennett, and gifted to the charity. 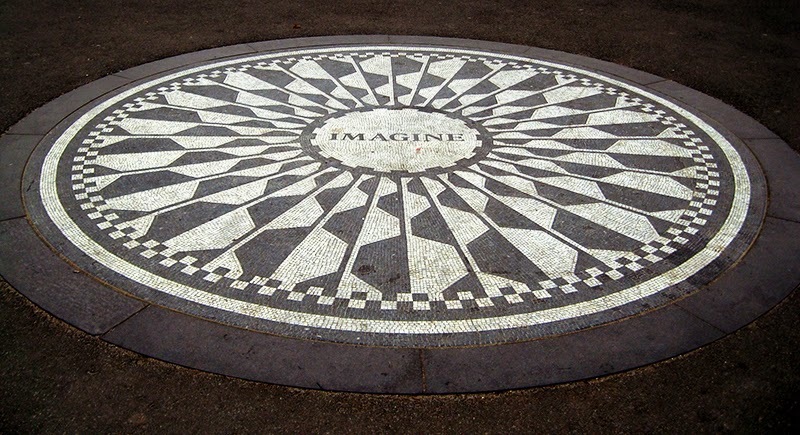 There is a small memorial to John Lennon in Central Park New York, called 'Strawberry Field', consisting of a circular flagged area where there are always flowers and notes and visitors. It's situated at the park entrance which John used frequently and is just across the road from the Dakota building. It's a long way from the original Strawberry Field both in time and space. 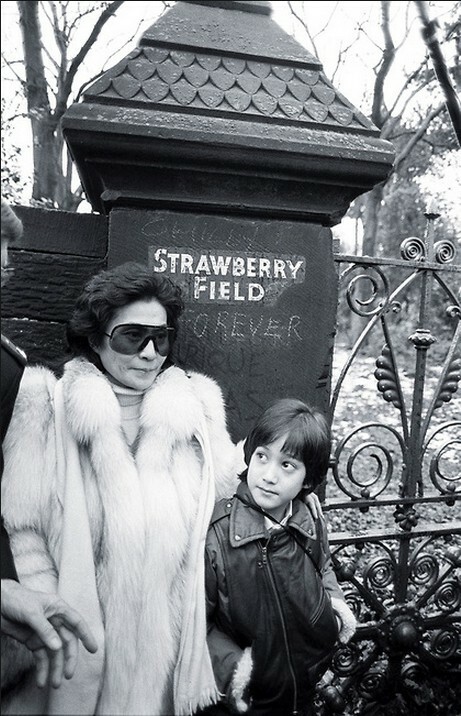 Strawberry Fields Forever was a double-A side on its release in vinyl and if John waxed lyrical about his teenage refuge then Paul fantasized about a suburbia he knew so well. If ever an example was needed to illustrate the differing personalities of John and Paul then that particular record is the consummate example. The dream-like qualities of John's opus has undertones of his saturnine nature while Penny Lane reflects Paul's cheery and optimistic view of life. The wonder of Penny Lane, the song, is that anyone could create such a memorable song out of such mundane subjects. 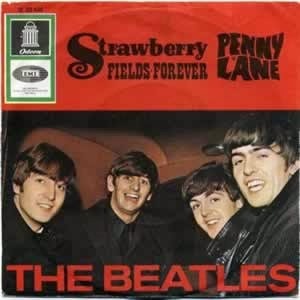 There's nothing special about Penny Lane, it's a typically English outpost of suburbia with bars and shops and library and charity shops , and yet its very ordinariness is what makes it so extraordinary and that's exactly what Paul is telling us in the song. And it's true that on a sunny day there is a certain je ne sais quoi about the place, an Englishness and a feeling that despite all the ills you read about in the papers here in this place life goes on as it always has and will continue to do so no matter what. And that's also what he saw so clearly. But Paul would never have known that the sparkling prettiness of the name Penny Lane had little to do with an inspirational City Councillor indulging a whim and saying " I think Penny Lane is just the job for this pretty area" and a great deal to do with celebrating the career and surname of one of the foremost slaver traders in the city in days gone by. It was in fact named after James Penny, an eighteenth century Liverpool merchant who engaged in the slave trade. There was move afoot in Liverpool to rename the streets named after slave traders. Of course, Penny Lane isn't going to be renamed. Not even the proponent of the renaming supports that. 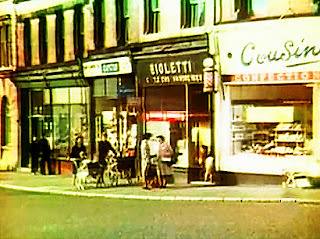 He took time and he took care and in so doing became a cult figure and a paragon among barbers of the time whose last employment was usually H.M's prisons and who regularly took less than 15 seconds flat to turn out a haircut one step removed from the one your Mum gave you using a basin and knife and fork. 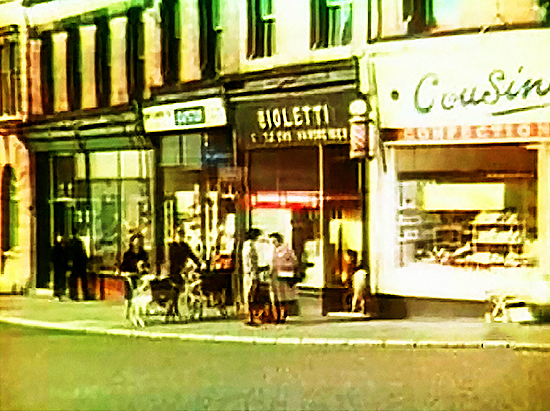 Most people walked around with haircuts like George Formby in those days but Mr Bioletti led us into The Promised Land and became a God in the process.